O jai, CA – The 57th ranked University of Utah men’s tennis team’s Pac-12 Championship run ended Thursday against 16th ranked California in the quarterfinal-round. The Golden Bears, seeded No. 4 in the tournament, beat No. 5 seeded Utah, 4-0. California gained an early lead by taking the doubles point. The Bears won at the No. 1 and No. 2 positions, 8-3 and 8-5 respectively. 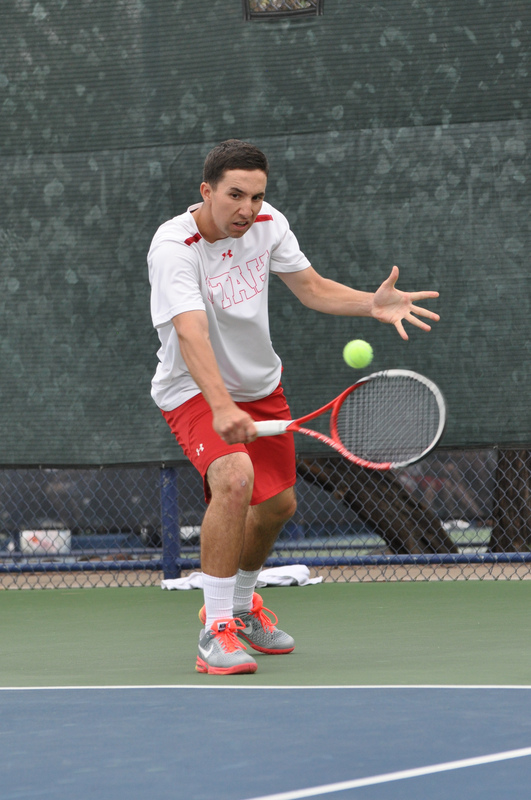 Utah struggled to gain traction in singles as Campbell Johnson of Cal defeated Senior Ben Tasevac 6-3, 6-1 at the No. 2 spot. Up 2-0, No. 84 Slim Hamza fell to No. 61 Ben McLachlan at the No. 1 postion, 6-3, 6-2. Andre Goransson clinched the match for the Golden Bears beating Cedric Willems 6-4, 6-2. After Cal secured the overall match at 4-0, the remaining matches were abandoned. Utah finishes the 2014 season with a 15-9 (3-6, Pac-12) record. This entry was posted in Schedule/Results and tagged Alejandro Medinilla, Ben Tasevac, Cal, Cedric Willems, Devin Lane, FD Robbins, Matt Cowley, Pac-12, Pac-12 Championships, Roeland Brateanu, Slim Hamza, Utah Utes. Bookmark the permalink.